The TLS-40L offers an unbelievable package for your business with touch screen technology, easy programming, substantial functionality and wireless networking capabilities to meet the label printing and weighing needs of your butcher shop, market or grocery store! The TLS-40L features stainless steel construction, customized printing formats and an easy to use touchscreen. Our scale features an AC adapter and built-in rechargeable batteries for convenient use in a variety of settings. The TLS-40L has a capacity of 40 lbs x .01 lbs ¨C this gives the scale exceptional precision to maximize your profits. Featuring 10,000 PLU memories, this scale has the ability to store 500 programmable ingredients and your store can designate up to 20 salespersons. The easy to change print cartridge expedites customer service and reduces downtime, while programming security is assured with multiple levels of access. Included software allows the scale to be easily programmed from a computer and all information downloaded via a local network to one or all TLS-40L scales in your store. The TLS-40L also features a rear LCD display to present publicity messages and individual sales information. Sales can be controlled for each scale or by a group of scales, and sales reports and lists can be easily printed from the scale. With a footprint of 16.1" x 18", this advanced label printing scale allows for multiple printing formats. 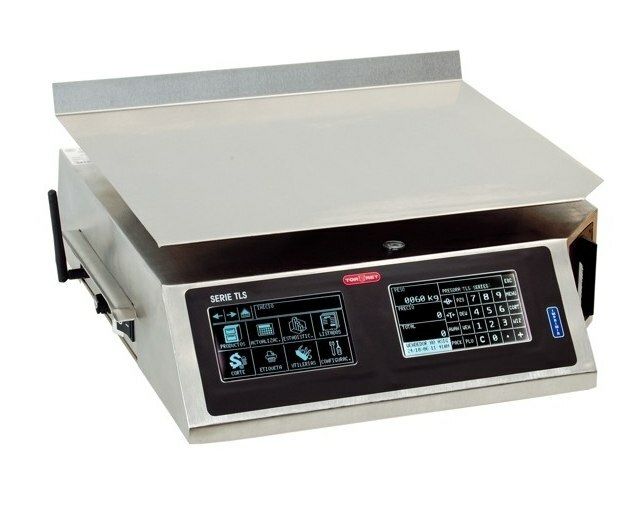 Whether you're weighing strawberries in a produce stand or pricing ground chuck in your meat department, the TLS-40L is an ideal tool for your business. So if you need a reliable label printing scale at a very affordable price, choose the TLS-40L from TOR REY. Click on our dealer link to find a dealer near you. NOTE: Software included with TLS-40L works with Windows XP Only (as of 02/2010, Windows 7 Version Pending).